4K technology is on the cusp of replacing the HD technology from TV screens, computer monitors, cameras, and projectors. The term 4K is used to refer to video signals with a horizontal resolution on the order of 4,000 pixels. A 4K resolution is 4096 x 2160 pixels (approximately a 1.9:1 aspect ratio). In a full HD resolution produced by the Blu-ray technology, a 4K image is composed of nearly 8.3 Million pixels, whereas a 1080p image has just more than 2 Million pixels. The 4K technology market was valued at USD 18.1 Billion in 2014 and it is expected to grow at a CAGR of 21.8% from 2015 to 2020. Different 4K technology-enabled products which have been considered in this report include TVs, monitors, tablets, smartphones, cameras, laptops, digital signage, set-top boxes, and Blu-ray players. 4K TVs accounted for the largest market share of ~49% of the 4K technology market in 2014. Although 4K tablets would be commercialized by the end of 2015, this product segment is expected to grow at the highest CAGR during the forecast period, followed by 4K Blu-ray players and 4K smartphones which are expected to be commercialized in 2016. This report covers the 4K technology market in regions, including the Americas, Europe, Asia-Pacific, and Rest of the World (RoW). The report also includes the market dynamics such as drivers, restraints, opportunities, and challenges. Apart from the market segmentation, the report also includes the critical market data and qualitative information for each product type, along with the critical analysis such as the Porter’s five forces analysis and the value chain analysis. The report also discusses the future roadmap of the global 4K technology market with respect to upcoming products and potential markets for the same. This report will provide valuable insights to various stakeholders of this market such as raw material suppliers, display manufacturers, OEMs, and distributers in order to formulate their market strategies. Similarly, this report will provide useful information to various technology forums, alliances, associations, research institutes, and organizations to understand the current trends in this market. In relation to the 4K technology report, two similar reports were published by MarketsandMarkets, namely, camera technology market (published in January 2015) and interactive display market (published in June 2015). Both these reports are available on the company’s website (www.marketsandmarkets.com) for reference. With the given market data, MarketsandMarkets offers customizations as per the company’s specific needs. Further breakdown of all the regions into major countries, and in-depth analysis and profiling of additional players on the basis of various blocks of the value chain can be provided as per a client requirement. 4K resolution provides four times more pixel density than that of full HD 1080p, with 8.3 Million pixels to display which enhances the picture quality along with incredibly intense colors and image details. Brilliant picture quality and vivid colors play a significant role in the growth of the 4K technology market. However, the lack of 4K content, discrepancy between screen size and viewing distance, and broadcasting problems of 4K contents are key factors limiting the growth of this market. On the basis of products, the 4K technology market has been segmented into TVs, monitors, smartphones, digital signage, tablets, set-top boxes, projectors, cameras and Blu-ray players. Among all, 4K TVs are expected to hold the largest share of the market at ~39% by 2020. The 4K TV market is sub segmented on the basis of screen size and the technology used. 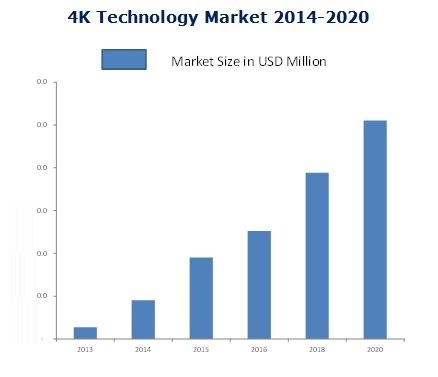 This report describes market trends, drivers, restraints, opportunities, and challenges for the 4K technologies market and forecasts the market size from 2014 to 2020 in terms of both value and volume. This report covers the market in major regions such as the Americas, Europe, APAC, and RoW. In 2014, APAC had the largest market size in terms of value; however, the market in RoW is projected to grow at the highest CAGR of 32.2% between 2015 and 2020. The global 4K technology market is estimated to grow at a CAGR of 21.8% to reach $102.1 Billion by 2020. A high demand from developing regions, enhanced picture quality and real colors, and rapidly declining ASP of 4K-enabled consumer electronic products are some of the major reasons for the growth of the market. The market has been witnessing a series of new product launches, announcements, and partnerships across the value chain. The report profiles major players along with their SWOT analysis in the 4K technology market. The key players included in the report are Canon Inc. (Japan), Blackmagic Design Pty Ltd. (Australia), Innolux Corp. (Taiwan), LG Electronics Corp. (South Korea), Panasonic Corp. (Japan), Samsung Electronics Corp. (South Korea), Sharp Corp. (Japan), Sony Corp. (Japan), JVC Kenwood Corp. (Japan), AsusTek Corp. (Taiwan), Hong Kong Skyworth Digital Holdings Ltd. (China), TCL Corp. (China), and Hisense Co., Ltd. (China). 10.2 Samsung Electronics Co., Ltd.
10.9 Blackmagic Design Pty Ltd.
10.10 Hong Kong Skyworth Digital Holdings Ltd.